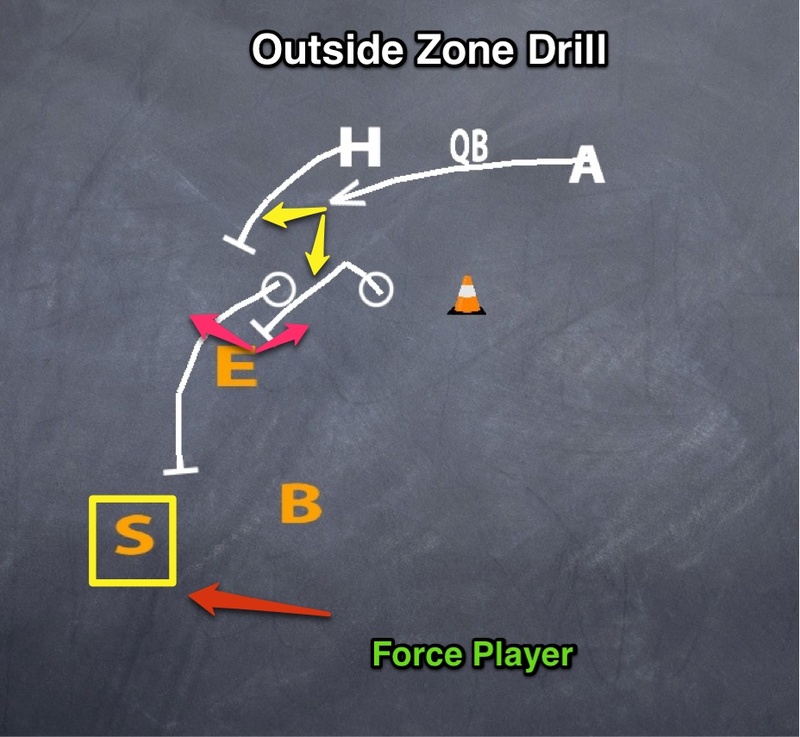 If you are running Outside Zone, you probably like it. And you probably want to be really good at it. You may already be. But to be the best at it, you have to drill the Outside Zone right. This is a Group Drill that will help you improve the Outside Zone without wasting anyone’s time. You can get this going both way and do it with or without Centers. I am always looking for ways to get maximum reps efficiently. If we can split this thing up and get 5 minutes of Outside Zone snaps, we should be able to get at least 10 reps to each side – that’s 20 reps of Outside Zone in FIVE MINUTES! Do not let the defense take the ball to the ground, and have defenders ready to rotate quickly if you need to. We don’t want gassed scout defenders, or needless tackles, to slow down our reps. Remember the purpose – to get lots of reps of Outside Zone, quickly. The Outside Zone Drill is going to be used after your Individual Period. In our Indy period on Offensive Line, we will work our 2 on 2 blocking for the the Outside Zone. In this drill, we work with a shaded down defender and a stacked Linebacker (or whatever we will see that week). The first lineman tries to rip through the Defensive End, while the second one tries to overtake him. If the Defensive End decides to run to the sideline to avoid being reached, our OT will stay with him and the Guard will climb to the second level. At the same time, the Running Backs and Quarterbacks are working their Outside Zone steps and reads. One key for the play is that the lead blocker takes the same reads as the ball carrier. If the End widens, we’ll cut it back inside of him. If he sits and is overtaken by the Guard, we will go to the outside. 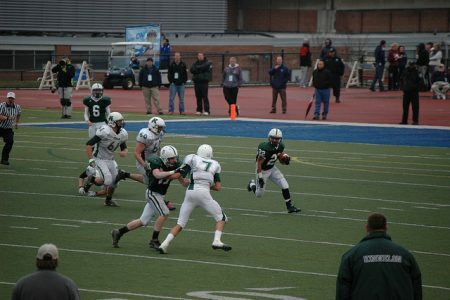 If the ball goes outside, the lead blocker takes his second read to the force player. If he can hook the force player, he will. If the force player stays outside, he should take him to the sidelines. The ball carrier has to read off the lead block outside. On a cutback, he is going to cram the ball and go to work. Now that we have worked hard in our Indy period to get all the fundamentals down, we can come together and run the play. With just the Guard and Tackle, two backs, and a Quarterback (Centers optional), we can get our work against 3 defenders – in whatever formation you are going to see that week. For maximum reps, your Guard and Tackle from the other side can be working with your back-up QB and backfield. Bonus: If your Defensive Lineman, Linebacker and Safety (in our defense, anyway) are not the same as your OL and Backs, you can get even more work! This drill lets your backs get a true read on what they will see with the Offensive Line blocking up front. Get quick reps, running one side and then the other. The Outside Zone is a major part of our Pistol Power Offense System. To learn more about the System, visit http://pistolpoweroffense.com today.